BOSTON – Kenya’s Daniel Chebii and Joan Chelimo returned to Boston with fierce final surges, claiming the men’s and women’s titles here at the 18th annual B.A.A. Half Marathon, presented by Dana-Farber Cancer Institute and the Jimmy Fund. Both Chebii and Chelimo separated from the pack late, powering to victory with times of 1:03:08 and 1:09:34. Our Guy Bligh: Bobby Bligh of the Hurtin’ For Certain Striders has run all 18 edition of the B.A.A. Half (this latest in 1:27). Established in 1887, the Boston Athletic Association is a non-profit organization with a mission of promoting a healthy lifestyle through sports, especially running. The B.A.A.’s Boston Marathon is the world’s oldest annual marathon, and the organization manages other local events and supports comprehensive charity, youth, and year-round running programs, including high performance athletes and running club. Since 1986, the principal sponsor of the Boston Marathon has been John Hancock Financial. The Boston Marathon is part of the Abbott World Marathon Majors, along with international marathons in Tokyo, London, Berlin, Chicago, and New York City. More than 60,000 runners will participate in B.A.A. events in 2018. The 123rd Boston Marathon will be held on Monday, April 15, 2019. For more information on the B.A.A., please visit www.baa.org. 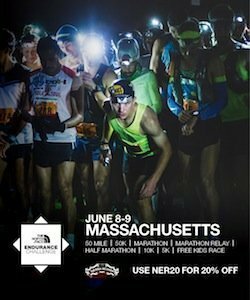 Next RI’s Sisson Sizzles at Reebok Boston 10K For Women – Battle Road TC Top Team Over B.A.A.